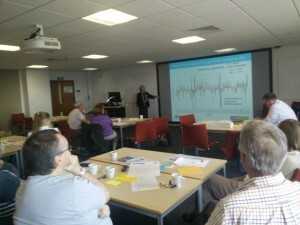 Last week DRY and About Drought held a workshop for allotment holders here at UWE. Over a full day we shared resources and co-produced new materials with participants from a diverse range of community, organisational and business perspectives. Joining us were members of the National Society for Allotments and Leisure Gardeners, the Wildlife Trust, a local farmer, committee members from the nearby Patchway allotment site, and an entrepreneur developing a moisture-retaining material. John Elson, a cartoonist, contributed ‘creative note-taking’ in the form of a series of cartoons that cleverly and humorously captured the day. In the morning we focused on sharing and building on materials we have created as part of the DRY project’s narrative and science communication work. Professor Lindsey McEwen outlined the project and shared UKCP09 scenarios for the Bristol Frome catchment and the most recent drought-related science developed through hydrological catchment modelling by our colleagues at CEH. Within this, we were keen to know whether allotment holders interpreted any potential problems or opportunities in terms of seasonal changes in rainfall, temperature, in total cloud cover and change in temperature of the coldest night under different climate change scenarios. 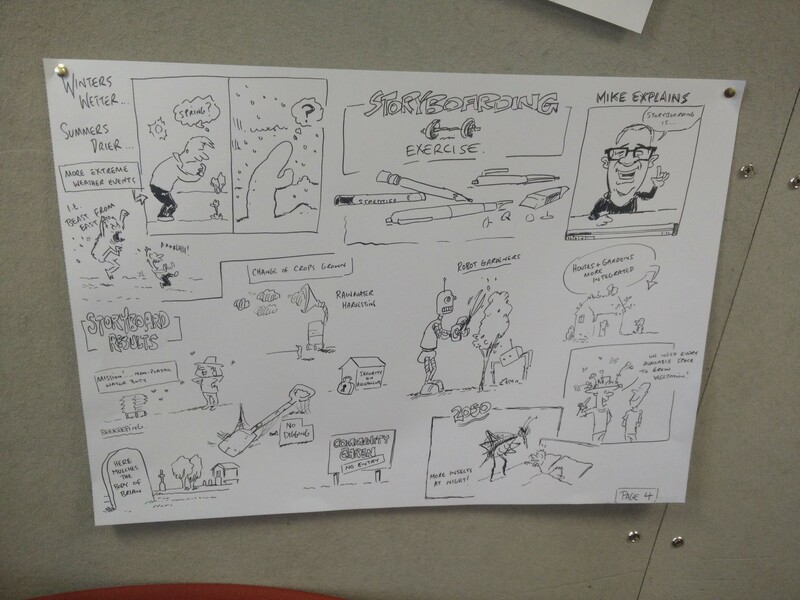 Following this, researcher Liz Roberts shared three digital stories that have been created with allotment holders in the South West. These stories prompted a series of discussions that incorporated the notion of creating shade versus stunting growth, of working collaboratively on allotments to make sure shade is created in the right areas, about the intergenerational aspect that came through in several of the stories about learning water practices from elders and then sharing that with children, sometimes from intercultural contexts (see Bharat’s story or Badra’s), and about the potential of growing different types of veg to adapt to changing growing conditions in the UK. Might we all move to a Mediterranean diet and what is the best way to cook a Yacón?? (‘water root’ in Inca) – after watching Chris’s story. 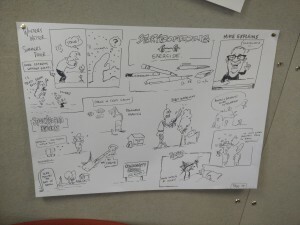 The participants then storyboarded their own future stories about adaptation under different climate change scenarios – linking food growing to a range of contexts including the social and political. In the afternoon, researcher Patty Ramirez shared currently available online resources about watering in allotments and gardens, such as advice produced by organisations like the RHS and Garden Organic. We also looked at different types of gardening knowledge (scientific and experiential; data and stories), and the ways allotment groups and relevant organisations disseminate planting and other types of advice. Having thought about the pros and cons of different types of materials, we considered how water advice could be integrated into existing resources. Participants suggested including information on the back of seed packets or including advice in guidelines and handbooks produced by the allotment committees for new allotment holders. We trialled whether it would be possible to create a timeline of seasonal or monthly advice about water practices on the allotment as you might see in gardening books that tell you when to do what. This experiment yielded mixed results. Although we agreed that it was dependent to an extent on what you grew and where, and how the weather or soil differed, we were able to plot some basic timeframes for when you can implement water storage and conservation. There were interesting discussions about how set seasonal timelines have been conceived in the past e.g. memories of parents pulling out wallflowers in May when they are still flowering due to seasonal advice in gardening almanacs. Throughout the activities of the day, some novel ideas came up such as rain chains and French drains, which hadn’t arisen in previous conversations with allotment holders. 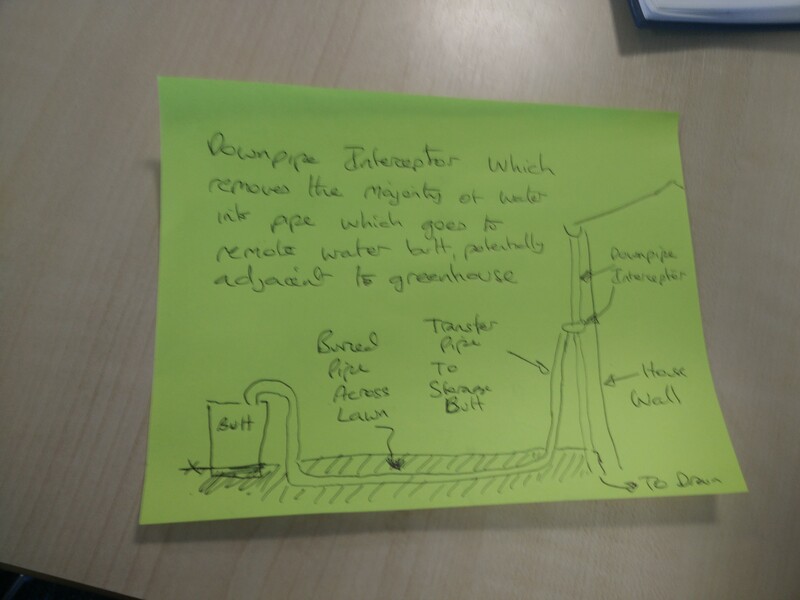 Some of these were quite innovative engineering solutions, and so discussion also entailed how best to implement more labour intensive solutions that some allotment holders or gardeners wouldn’t feel they had the skills for. 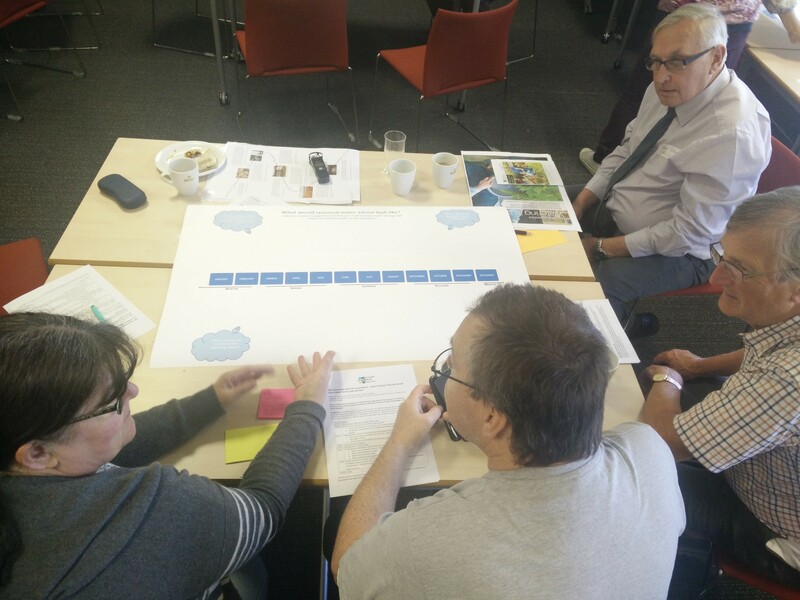 Participants observed differences between creating new structures on private gardens or farms, and on allotments due to the local council or other land-owner restrictions that allotments can face, as well as the relations and need for negotiation between neighbouring plot holders. A parallel and overlapping theme of the day was about the need for education, whether this be with children in schools, working alongside allotment groups, or through on-site signage or informal sharing of knowledge through open days and special events at allotment sites. Thanks to everyone who came along! Please get in touch if you would like to be involved in any future work that follows on from this such as our development of resources (DRY@uwe.ac.uk). ← DRY weather and the allotment: What would you do on an allotment with less water?